Many of my Facebook friends have already heard this so please forgive me for repeating myself. Over a period of 3 months I have suffered a great deal with severe back pain. My doctor finally did an MRI on me and found I have a ruptured disc and a pinched nerve. My Neurosurgeon was very concerned because over the months it took to finally diagnose what was wrong with me, I had developed a limp that they call drop foot. This could end up as a permanent limp and can become worse, with an exaggerated limp, if I waited much longer to have the surgery. My doctor wanted me to do the surgery right away but I couldn't because I had been on Motrin for quite some time (Motrin thins your blood). I had to wait 2 weeks to get the Motrin out of my system before I could do the surgery. I had a vacation scheduled to go to Costa Rica for two weeks. My doctor didn't want me to go but I told him I couldn't cancel (I was leaving for the trip in just 2 days) besides, I could spend the two week period relaxing on a beach or stay at home and play with my three Rottweilers, LMAO. He agreed that if I was very careful I could go on the vacation. We took care all of my pre-op stuff right then and there and I left for vacation in 2 days (unfortunately I had to be very careful and couldn't do a lot of things even if I was on medication to control the pain). I got home from Costa Rica December 11th and on December 12th I had back surgery and went home on the 13th. My doctor stressed that I should not be bumped around or fall (yeah right, with 3 Rottweilers in the house). So with that being said.... my husband came up with the great idea of putting an X-pen around my reclining chair so the dogs can't get to me and try to climb up in my lap or jump up on me. 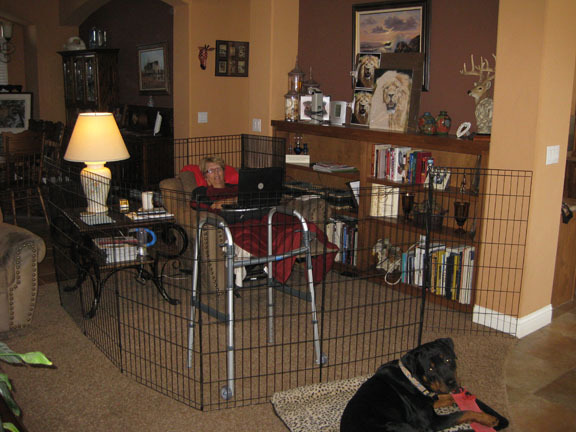 So that explains the picture of me with a fence around my chair, LOL. Up until now I have been in to much pain to deal with much of anything. Fortunately I am starting to feel better so therefore I should be able to start working on Simba the lion again. I'm thinking I will try to do some drawing tomorrow. I just have to figure out how to do it while I am reclining, my doctor says I can't do to much sitting. Hopefully I will have an update to Simba soon. I want to thank all of my followers for being patient while I have not been very consistent with my art and blog posts. You all have a Happy Holiday and most of all..... Keep Scribbling! Well... after a month or two I am finally able to draw. My back is doing better but it isn't completely well yet. My doctor prescribed some medication that is helping considerably. 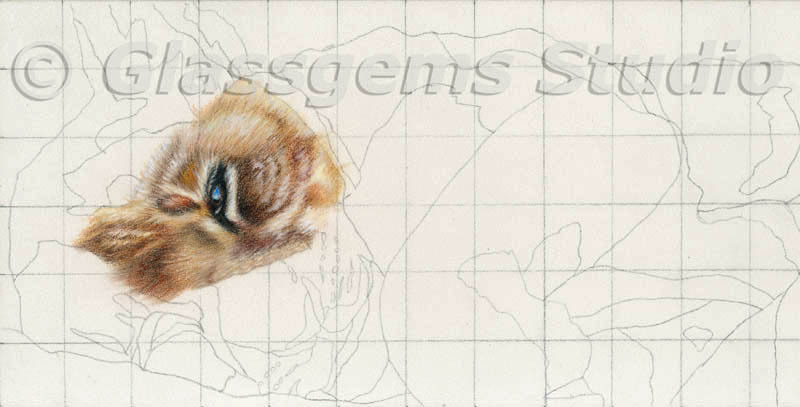 I finally got a chance to do some work on Simba. I've gotten most of the fun stuff done and I'm now working on his mane. 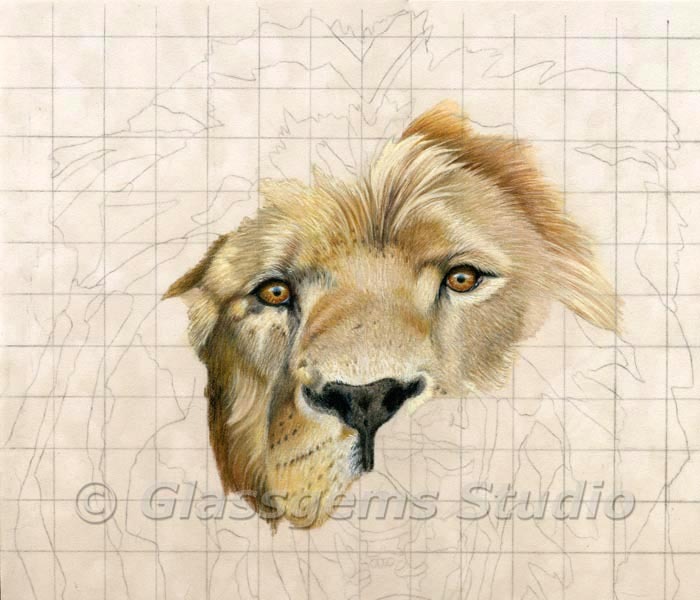 He is such a pretty boy, I'm really enjoying doing his portrait. I was hoping I would have him done by now but this setback with my back injury took care of that. 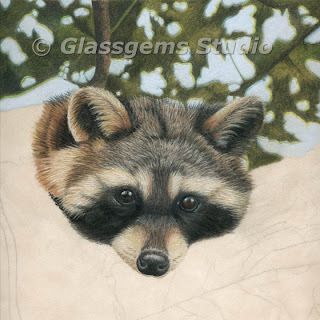 I have less than 2 weeks before I will be teaching the workshop on the Ann Kullberg Colored Pencil Cruise so I'm thinking I probably won't be able to finish him before I leave but we'll see.... I'm going to give it a try. If you should have any questions at all please don't hesitate to speak up. Thanks for checking in and don't forget to keep scribbling! I thought I should let you all know what's going on with me. I recently hurt my back and have a pinched sciatic nerve. I've been down with this for about a month... very painful!!! I've been going to a Chiropractor but decided it was a good idea to go to my doctor as well. My doctor requested some blood tests to make sure all is good there and she has given me some Motrin and mussel relaxers. I am starting to feel better and I'm hoping to be back to normal soon. I haven't been able to draw because it hurts to sit or stand for to long so..... as I get better I hope to be able to get back to the lion. Thanks so much for following me and don't forget to keep scribbling!! Here's another update on Simba! As you can see I am moving right along. I'm starting to get the background in on the right side as I go along. So far I have used 100% colored pencils and it's done on Suede Mat board. When I work in colored pencils I use several different brands. Most of this is done in Prismacolor however; it does also have Derwent Studios, Derwent Colorsoft, Faber Castell Polychromos, Derwent Artist and I think that's about it. If you're wondering why I use so many different brands.... it's because of color choice and also because the different pencils behave a bit differently and are better for some things. 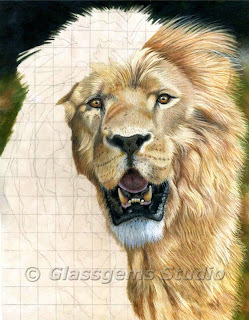 As an example I really like Derwent Studios for fine fur, they are a harder pencil which makes it great for fine hair. I have found I don't have any problem at all with mixing different brands of pencils. They all seem to work fine with one another. If you should have any questions don't hesitate to speak up and comments are also welcomed. For those of you who have been following my "Work In Progress" on Simba the lion, I thought I would share a wonderful video with you!! 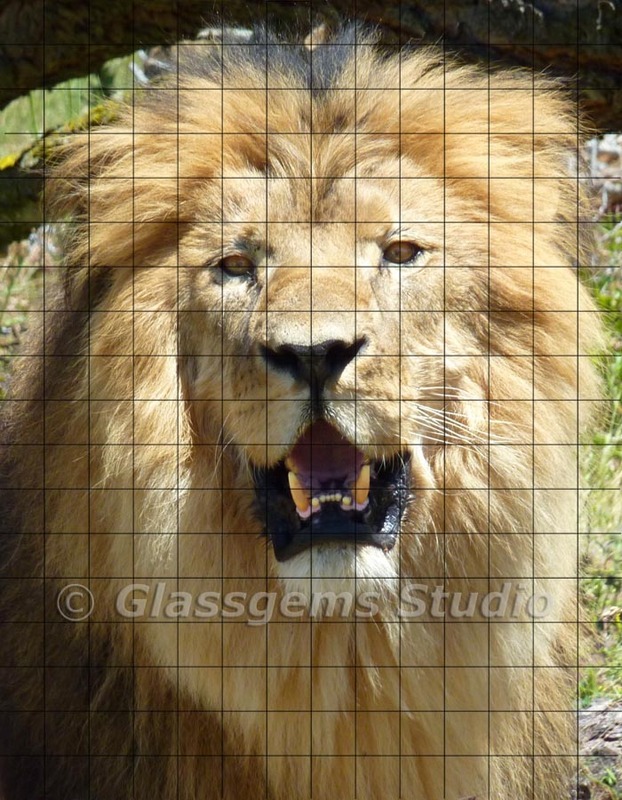 I just got an email from Lisa, at Animal Defenders International (ADI) and they have recently rescued several other Lions from the Bolivian Circus! This video shows Pancho, Temuco, Chitara, Delila and Kenya all being released in their new 20 acre habitat. It is unbelievable, that up till now, these lions lived in a cage no larger than a bed for all of their lives. It is so incredible to watch them in this video romp and play after being released to their new habitat in Colorado. ADI is an incredible organization who are doing incredible things for these captive animals. 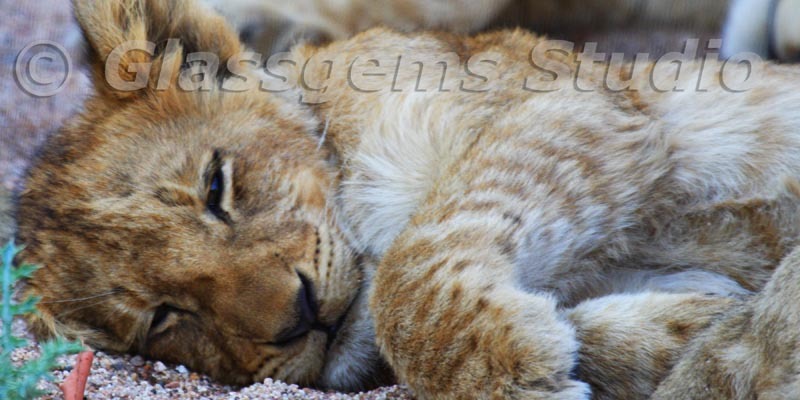 Enjoy the video of Pancho, Temuco, Chitara, Delila and Kenya in their new habitats. Nancy asked that I post a closeup of the muzzle, in one of her comments. So...... here it is! If you have any questions just speak up and keep scribbling!! 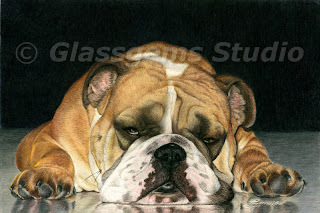 I hope all is doing OK with those of you on the East Coast after Hurricane Irene!!! Here's an update of the Lion I'm doing for Animal Defenders International. As you can see I haven't gotten a lot done, life just seems to be getting in the way, LOL. I'm hoping to be able to spend more time on it in the next couple of weeks. I'm using the same procedure as I usually do, nothing really new so, I can't think of anything else to say about this guy. I'm still working in the mouth area so there will be some changes, I'm sure, in that area, with the next update. If you should have any questions or comments please don't hesitate to speak up. Have a great day and most of all don't forget to Keep Scribbling!! Well... I guess you might be wondering what happened to me. As I am sure you can imagine, as the Conventions Director of CPSA, I was extremely busy with the convention planning. I have to say, CPSA pulled off another great convention but I am glad to get back to my art. I just got some extremely good news. I got an email notifying me that one of my pieces of artwork was accepted in the "Strokes of Genius 4, Best of Drawing" contest. The really great thing about this news is that the winning contestants will have their artwork published in one of the Northlight books called "Stokes of Genius, Best of Drawing". They had 1650 entries and only accepted 112 artists. I have no idea which drawing they accepted but I'm supposed hear the details by August 6th. The two artworks I entered are posted here to the left. They are "Rest Stop" and "Gulliver". As of right now, there are 2 Stokes of Genius books publish and one on pre-order. Stokes of Genius 3 will be published and available in November so I'm thinking the Stokes of Genius 4 (which is the one my artwork will be in) won't be available for at least a year or so. 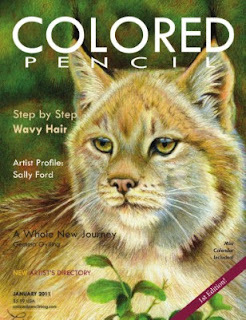 None the less... this is a very exciting milestone for me as a colored pencil artist. I am definitely doing the happy dance! Here is the link for the accepted artists: http://www.artistsnetwork.com/medium/drawing/strokes-of-genius-4-winners-announced. 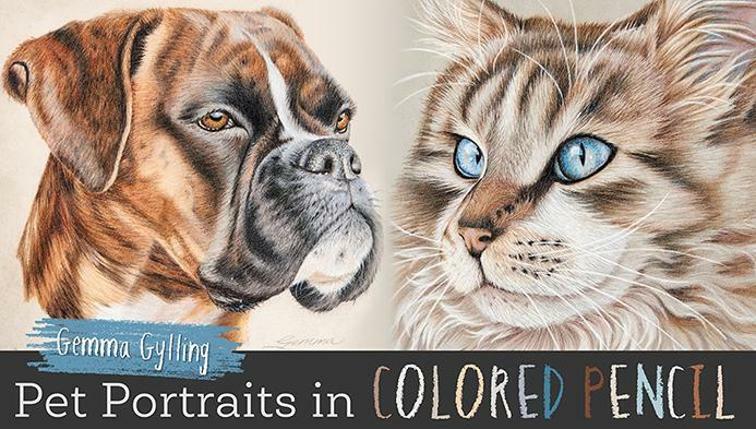 I want to congratulate the rest of the Colored Pencil artists who made the cut. 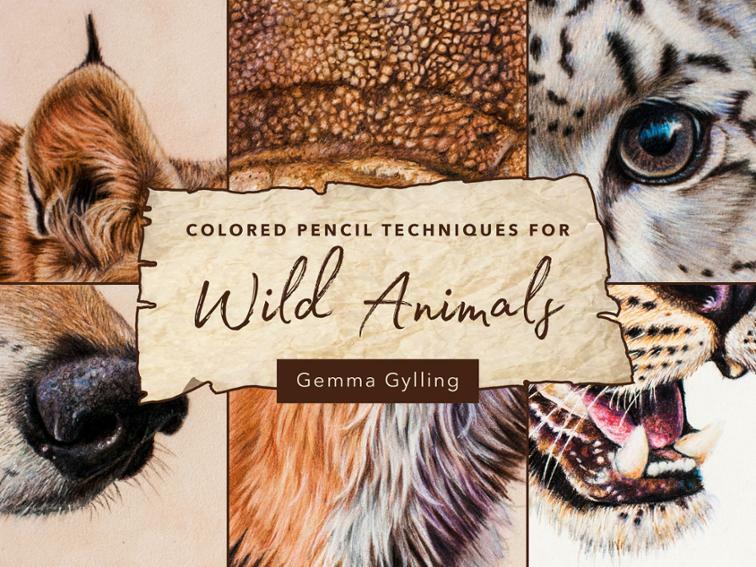 I see several names I recognize and am very proud to be included with those colored pencil artists I admire. I am back to work on the Ostrich and should have an update very soon. 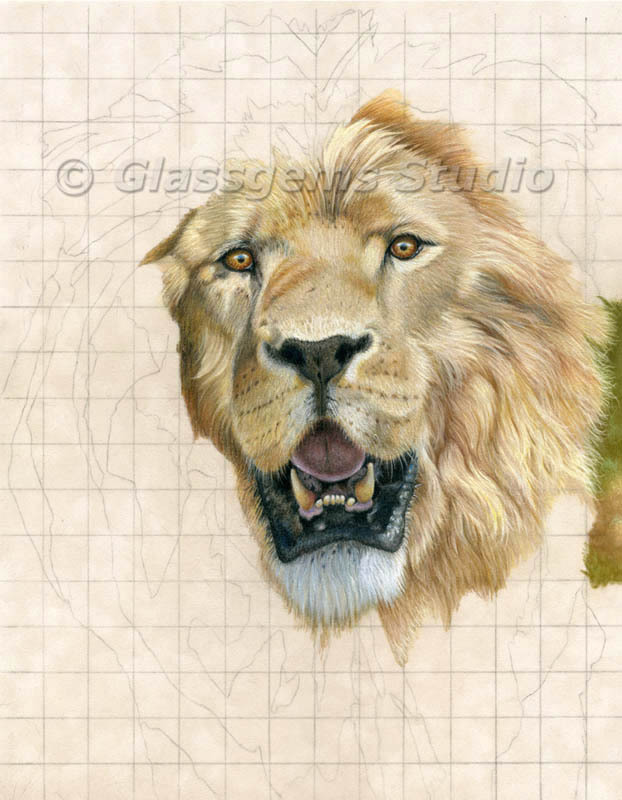 I am also starting the planning of a Lion I am doing for a commission. 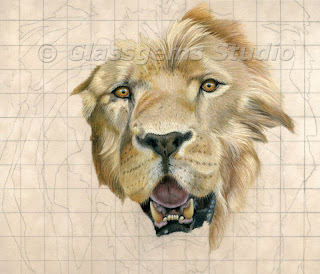 As soon as I finish the Ostrich I will start the Lion and will post that work in progress. Here's an update of the piece I'm doing for the Colored Pencil Society of America silent auction. There's not a whole lot to say about the piece. It's done in 100% colored pencil on Ampersand's Pastelbord. 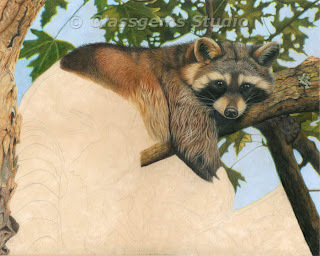 I'm close to being done so it looks like I will be finished with this piece in time.... Phew, LOL. 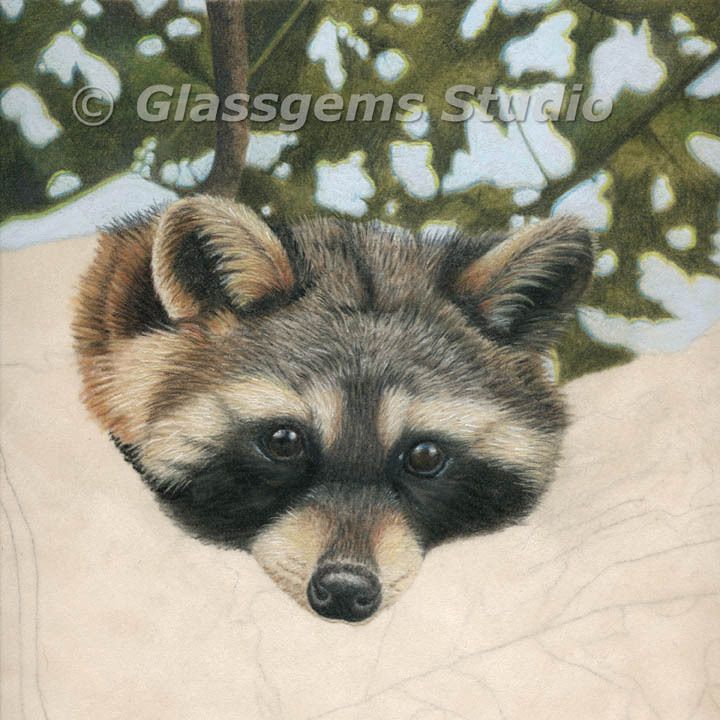 So far I'm happy with the piece.... of course I just love the subject matter, this little guy is so darn cute sleeping with one eye half open. As usual I'm having a problem with coming up with a title, if any of you have a suggest it would be greatly appreciated. If you should have any comments or questions just let me know and above all..... Keep Scribbling. 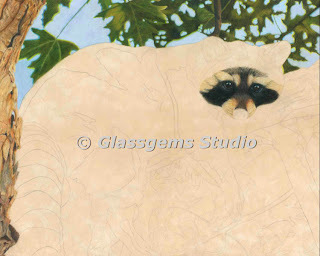 I thought I would post the piece I am creating for the Colored Pencil Society of America Silent Auction. This piece is done on white Pastelboard and is 6" x 12" and done with 100% colored pencils. 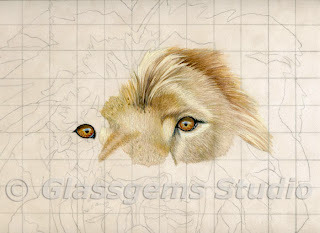 Here is the first update of the little lion. If you have any questions or comments, don't hesitate to speak up. So far I'm using some new pencils by Jerry's Artarama called SOHO and prismacolor. 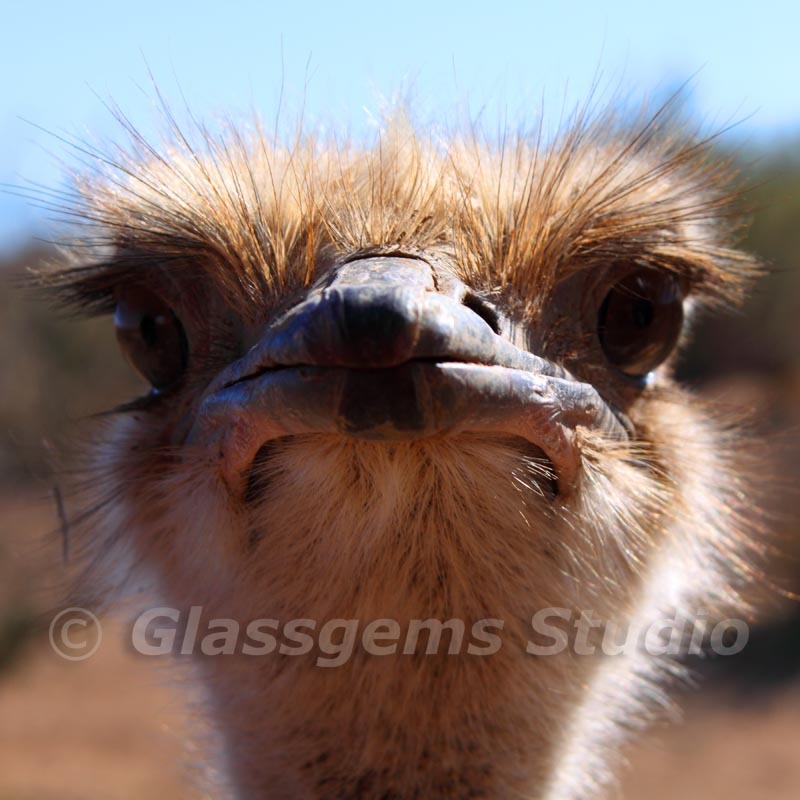 If you are wondering at what stage the Ostrich is at.... I had to put that one on the back burner in order to get this piece done in time for the Silent Auction. This piece has to be done within a month, I will be posting more updates as I progress. 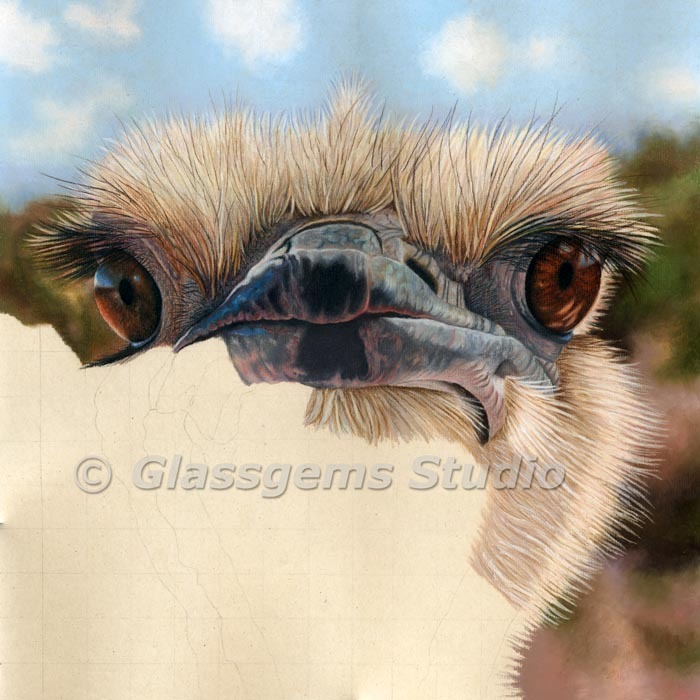 Here's another update on the Ostrich. I'm now working on the feathers under his chin and along his left side so, they still need some work. As I mentioned before I may have to take a break on this guy soon because as soon as I get the support I ordered for my CPSA Silent Auction piece I will start working on it. I will post my progress on the Silent Auction piece and continue to post any progress on this piece as well. I'm having fun creating this guy... he just cracks me up every time I see him. I sure hope I can express the feeling I am trying to get with him. He's 16" x 16", on UArt and 100% Colored Pencil. As mentioned before.... I'm using the Icarus heated board to blend the colored pencil. What a great tool that board can be.... I just love!! If you have any questions or comments let me know. Don't forget... Keep Scribbling!! I am very excited to hear that my Mountain Lion artwork titled, "Reflections" was accepted in the Colored Pencil Society of America, 19th Annual International Exhibition. 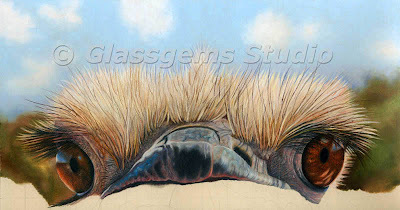 This piece was done on tan Suede Mat Board, is done with 100% colored pencil and the size is 24" x 10". The exhibition will be June 29 - July 31, in Dallas, TX. This is a wonderful honor and I am just thrilled!! Here's another update on the Ostrich. I'm probably going to have to stop working on this piece for a while to create my Silent Auction donation to CPSA for the Convention. 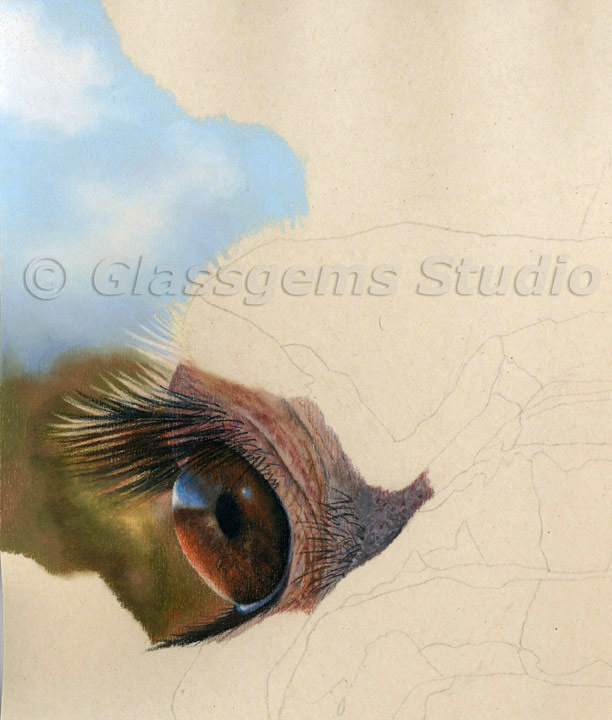 I will do a work in progress on the silent auction piece as well, so keep checking back. I had to order the support I plan on using for the silent auction piece so I will continue on this until I get that order. As for the Ostrich.... 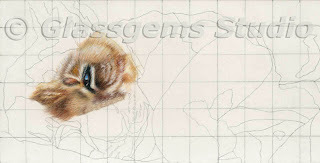 I'm continuing to create this piece using predominantly Prismacolor pencils along with some Derwent Colorsoft Pencils. I am also continuing to use my Icarus heated board to lay down the pencils. I am actually drawing while on the heated section on the board and then blending the pencil using a stomp. I'm really enjoying using this process, it gives you a feeling of painting rather than drawing. The image I posted is only the upper half of the piece. The piece is actually 16" x 16" square and I haven't started working on the lower half yet. If you have any questions or comments let me know, in the mean time..... Keep Scribbling! Here's the reference photo I'm using to create my next piece. This photo what taken while we were in Arizona at a place called "Out of Africa". When I took this picture this guy was just about to peck my lens, he got very close. This piece will be done with 100% Colored Pencils on UArt Sanded Surface, the 600 grit. The finished piece will be 16" x 16" and I plan on using this exact composition so it will be one really big face, LOL. After studying this piece on the computer I found a few things I didn't like about it so I tweaked it a bit. So........... Here's my final piece. If you are wondering what was bothering..... I found that the front, back leg seemed to be coming forward a bit. So I worked that a bit to push it back. Well..... I finally finished this guy. I'm pretty happy with the way he came out. 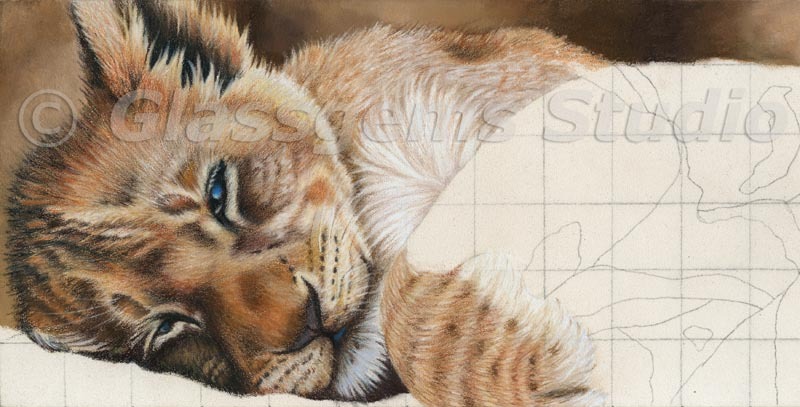 As I mentioned before he was done on Suede mat board, using predominantly Prismacolor pencils, some Derwent Colorsoft and some pastels (not to much pastel though). The size is 16" x 20". I'm still not sure what I'm going to title this piece so I'm still thinking on that. I haven't heard of any suggestions from anyone so if you can think of something, please let me know. If any of you should have any questions or comments please speak up. And..... I really really do need some help with a title. Thanks for watching this Work In Progress.... and don't forget..... Keep Scribbling!! I know this seems to be going kind of slow..... again.... LOL. But, I have been very busy with the dog show stuff, my CPSA volunteer job and life in general. Here's another update. I'm continuing on with the same pallet. A little bit of pastel, here and there but predominantly Colored Pencil. I am using Prismacolor pencils and some Derwent Colorsoft Pencils. I'm fairly pleased with the way this little guy is coming out. 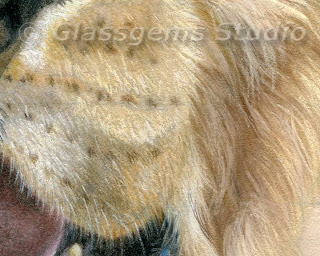 I hope to have him done so I can enter him in either the Artists for Conservation Exhibition or the Society of Animal Artists Exhibition. This week I do have lots of other things going on so I may not have an update for a week or so but hopefully I can get some time in the evenings on this guy. If any of you have a suggestion for a title of this piece I would really appreciate your input. I was thinking of calling it "Hanging in There" but I'm not real sure of that title. Let me know what you think and if you have a suggestion for a title. Here's another update on this little guy. I'm fairly pleased with the way he is coming out so far. This really isn't a good stage to share because the difference in hair color really doesn't make sense. If you refer to the reference photo I posted earlier it will make better sense. The lighter redish color on his fur is due to the sunlight. I don't really have much more to say or share with you so if you should have questions let me know. Here's another update. I finished the little guys face (I still need to add his whiskers) and started to work my way down his front leg and his back. I also got the tree limb he is hanging on done. The limb was fun to do. I used the same process I have been using. I'm laying down the mid color first and then adding the lights and darks on top of that. I also added some moss green and other greens to represent the moss on the tree limb, it doesn't show up that well in this image but in RIL you can definitely see the moss. If you have any questions or comments don't hesitate to speak up. Keep Scribbling!!! I almost forgot to share some of my very exciting news with all of you! There is a brand new magazine out called Colored Pencil Magazine. The very first issue has a feature article about me and my artwork is also on the cover, I was just thrilled to pieces. 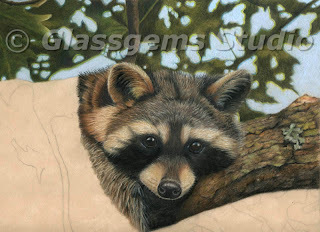 I hope to have an update of the Raccoon very soon so keep checking back. Don't forget to keep Scribbling!! Here's another update on the Raccoon. I didn't bother to post the whole artwork because the only change was to the raccoon's face. 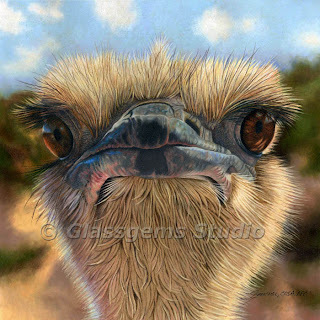 I'm am using some pastels in this piece but not much. I used pastel in the blue of the sky (pastel over pencil) and a few pastels under the colored pencil in some of the fur areas. I would guess that this artwork is about 80% colored pencil so far. One of the things I have found with the pastel is.... if you are using the harder pastels you need to lay those down before the CP. If you use a softer pastel it will cover the CP. 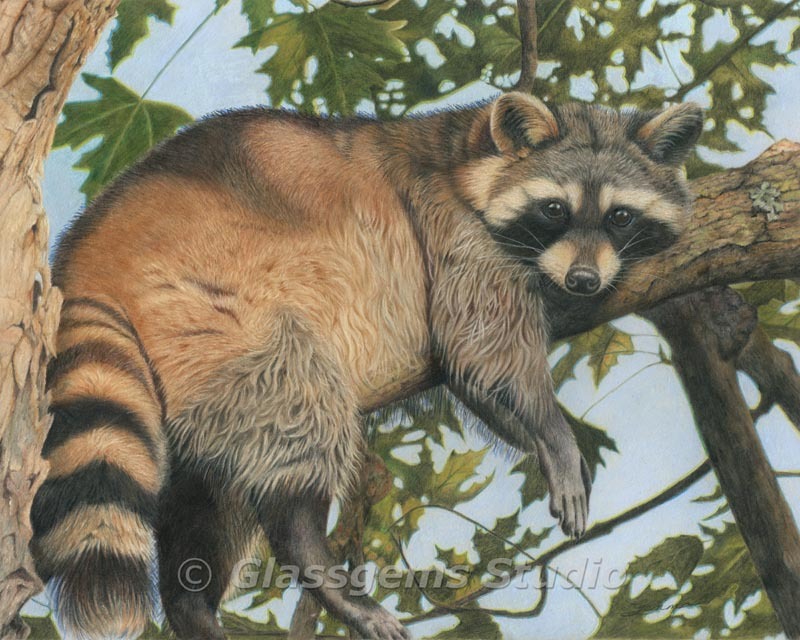 I used pastel pencils in the rusty colored fur. 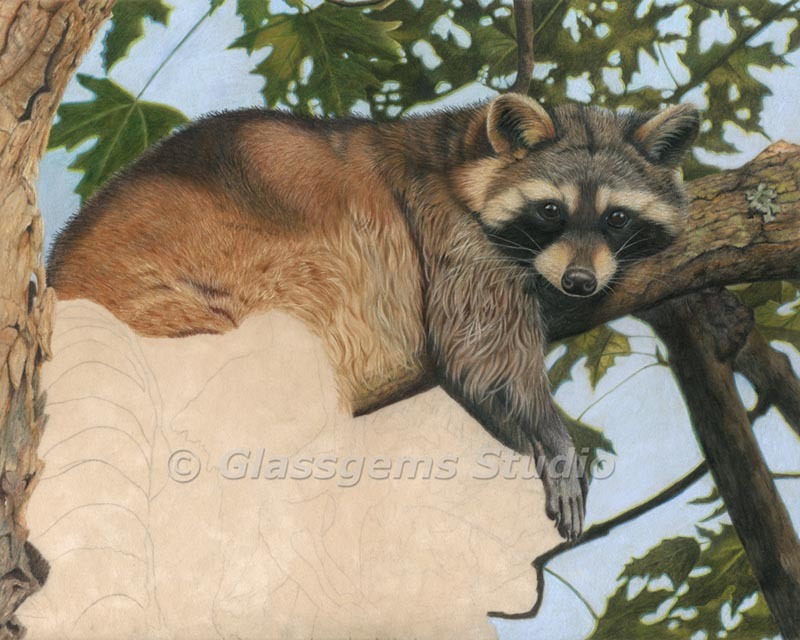 First I did an under-painting with the pastel pencils and then went over that with Colored pencil. Another pencil that does really well on the Suede mat board is General's Carbon Sketch pencil. It will layer over the CP quite nicely. I was able to go in after the fur was almost complete and punch up some of the blacks. 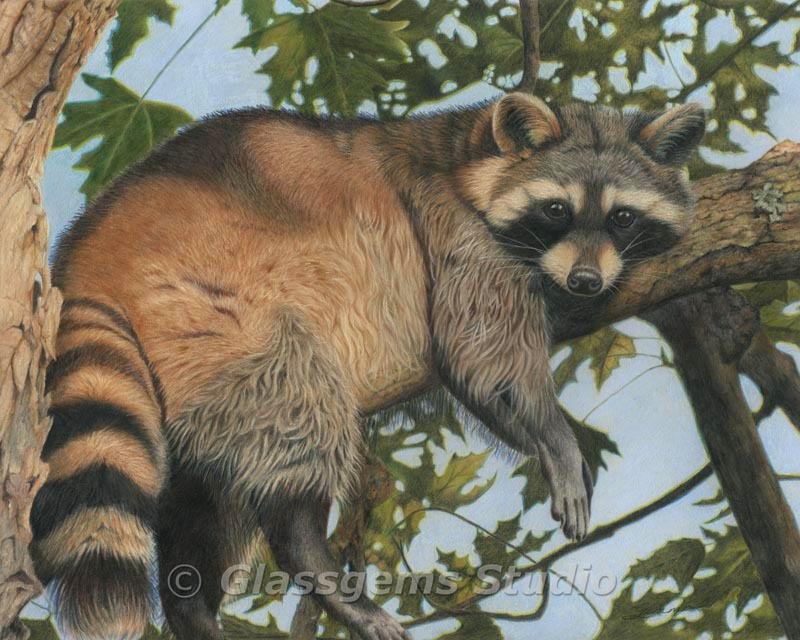 Keep in mind, because of the pastels that I'm using, this piece would not be eligible for the Colored Pencil Society of America's International Exhibition. It would however; be OK for the "Explore This!" exhibition. 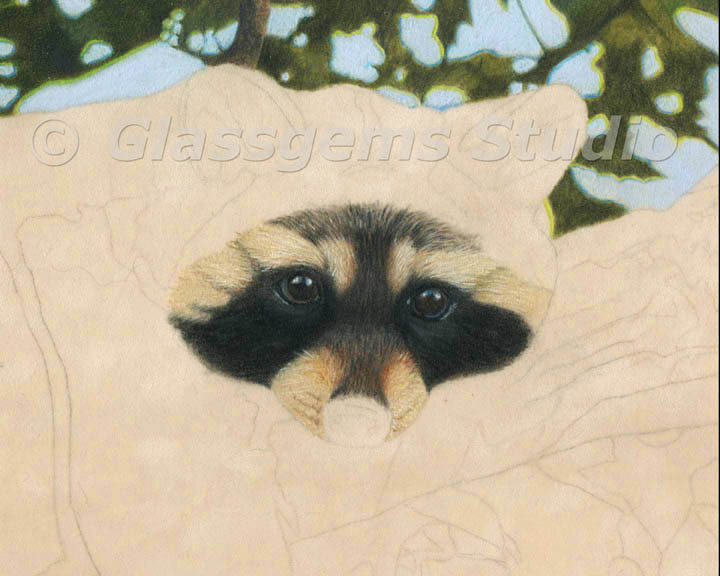 So far, I'm really enjoying drawing this cute little fella. If you should have any questions let me know, I'll be happy to help in anyway I can. Well... As I'm sure you will all understand the holiday season kept me real busy so, therefore, I just didn't get much of a chance to draw at all. Plus I had the commission piece (the Rottweiler called Abby) I had to finish before Christmas. I finally got a chance to get back to work on the raccoon. I was able to get the sky behind him done and just started his face today. I still have some more work to do on the face but I thought I would go ahead and post my progress so far. 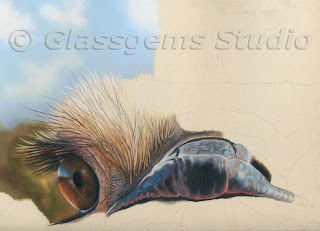 The first image is the total piece, it's 16" x 20" and it's being done on a very light beige suede mat board. If you want to see the reference photo I'm working from it was posted in one of the earlier posts when I first started this guy. You should be able to just scroll down a bit to see it. If it's not on this page just click on raccoon to the right of this page. I thought I would post a close up of his face too. The process I'm using is to lay down a mid color range colored pencil and then add light CP's and dark CP's on top of that. That is the nice thing about working on suede board, it allows you to put light colors on top of darker colors and they show up quite nicely. I'm kind of anxious to get this guy done because I already have a few other drawings I want to get started on. I actually have about 5 compositions all ready to go. I guess that's what happens... your always thinking about the next piece you're going to work on. I plan on working on this guy quite a bit this week so keep checking back I hope to have some progress to share with you soon. If you should have any questions or thoughts don't hesitate to speak up. And.... above all don't forget to keep Scribbling! !